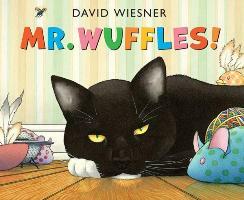 David Wiesner’s book, Mr. Wuffles, winner of a 2014 Caldecott Honor Book designation, put me in mind of the phrase, “strange bedfellows” and the Disney movie Cinderella. Please bear with me if all this seems a bit strange and I will explain all. Even if you are a huge fan of the classic picture book, as I am, you have to be in awe of an imagination that conceived this book’s premise and the art that executed it. Mr. Wiesner ingeniously gives a tip of the hat to the Lascaux Cave paintings of 1940, discovered by one Marcel Ravidat near a village called Montignac, in southwestern France; and how he executes this feat is even more amazing. Just some background on Lascaux first; Ravidat, an 18-year-old garage mechanic at the time, wandered into a cave in the Dordogne region and uncovered startling Paleolithic era cave art, revealing drawings of animals unseen by humans for 17,000 years! Side note: The cave was closed in 1963 to protect the 600 paintings and 1500 engravings found there from deterioration. Cooperation ensues of necessity between the ant inhabitants of the vent, other insects that live there, in concert WITH the aliens in order to repair their spaceship for their return voyage home. Which brings me full circle to the “strange bedfellows” phrase and Cinderella. In the movie, Cinderella is in dire straits as the evil stepmother and her harridan daughters have locked Cindy in her room, correct? How can she try on the glass slipper? Just who stands in the way of opening her door with the rescued key? None other than Lucifer, the cat, that’s who! Banding together mice and birds help outsmart the fat beady-eyed black cat that stands in the way of Cinderella having the chance to try on the glass slipper and find her way HOME – to the castle! Everyone is Dorothy in one way or another, as there really is no place like home whether it’s a planet out THERE or a home in a vent. It may be a stretch, but I think Mr. Wiesner is trying for a way to express the commonality of the need for cooperation and ways of expressing experience that stretches across species and time! Banding together for a cause seems to be nothing new in the universe, Mr. Wuffles seems to be suggesting. Wouldn’t it be nice to think that it were so. This is a book that definitely requires a sit down with your young reader where together the story is fleshed out in their words, with help from you. The really excellent avenue for an opening up of a possible discussion exists here about cooperation and the discovery of the Lascaux cave paintings. Thanks, Mr. Wuffles for the lead in to further inquiry of great topics and also a very inventive way of expressing the need for cooperation, even if it is cross species! And, yes, we know you were only doing your job as protector of the house! But even cats need to lighten up once in a while!